Indra Nooyi is Chairman and Chief Executive Officer of PepsiCo. Within its global food and beverage portfolio, PepsiCo has 22 brands that each generate more than US$1 billion in annual retail sales. 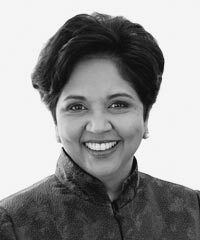 Nooyi is the chief architect of Performance with Purpose, PepsiCo’s promise to do what’s right for business by doing what’s right for people and the planet. It’s the company’s commitment to sustained growth with a focus on performance, human, environmental, and talent sustainability. In keeping with this commitment, PepsiCo is proud to be listed on both the Dow Jones Sustainability North America and World Indexes. Nooyi was named President and CEO in 2006 and became Chairman in 2007. She has directed the company’s global strategy for more than a decade and led its restructuring, including the divestiture of its restaurants into the successful YUM! Brands Inc., acquisition of Tropicana, mergers with Quaker Oats and PepsiCo’s anchor bottlers, and acquisition of Wimm-Bill-Dann, the company’s largest international acquisition.